saw this posted over at the fan club. robinannhunt, Claire2004, teesharky and 9 others like this. That's funny that it's a $45 book, but so cool that they are on the front of the book! CarrieUnderwoodismyHero and robinannhunt like this. Price is because it is an "Oxford Book". isn't oxford a city in England? Anyone with a kindle, click on the "I would like to see this book available on kindle". It is so much cheaper there. Maybe they will put it on! Yes, and it is also probably the largest publishing house in all of Europe. 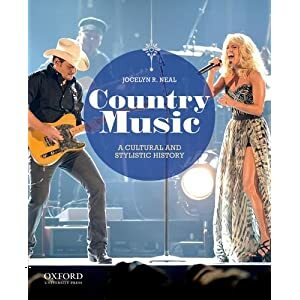 Country Music: A Cultural and Stylistic History is the first undergraduate textbook that focuses solely on country music. robinannhunt and CarrieUnderwoodismyHero like this. well considering the fact it is a textbook compare to what i had to pay for my textbooks 45 dollars is cheap, my cheapest book this semester was over 100 dollars. yeah this is a school book..it was on twitter a few days ago..so cool! cole and rainbow1 like this. I agree with cole taking a country music class would be awesome! $45 for a textbook???? OMG I paid over $700 for my textbooks this semester and the cheapest was $95.... lucky people! if i were you i would sell those book (at the end of the semester when you are no longer going to use them) and with the money go to a CU concert. I actually wish I could just have a class on Carrie period...I would obviously get an A+ in the class . Homework could be like "Chose one Carrie song and write an essay analyzing the lyrics" or "Recreate your choice of either a Vitamin Water or Olay Carrie commercial". Lol I can dream! carrieguy2 and cole like this.